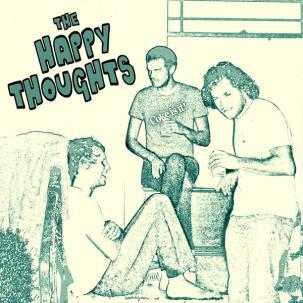 “We’ll admit, this finished album landed at our headquarters late last summer, but it just seemed unfair to release it in the Fall or Winter months, since this debut LP by the HAPPY THOUGHTS is such an incredibly classic-sounding ‘Summer album’ in all aspects of the term. How do guitar riffs like these clear the clouds away so well, while embracing a pure freshness in such a familiar sense? You’ll feel like you’ve been listening to these songs your whole life. As clean and crisp as the early ‘60s-infused rock’n roll backbeat holding onto these songs for dear life, each track sticks right to your ribs, and with the addition of a full band, compared to the previous solo recordings, it’s a richness you didn’t even know you deserved. Purity, harmony, and true, unabridged happiness come bleeding through this collection of songs even more impressively than on the other bands ERIC LAGRANGE has played a pivotal part in, namely, the excellence of the CAVE WEDDINGS and ROMANCE NOVELS (the latter of which, chosen by Nobunny for support on his first US tour).” For fans of Bobby Fuller Four, Nobunny, Fevers, Shoes.